The strategy at OmiCronFX is to attempt to find trends in Foreign Exchange currency pairs that are long lasting and as regular as possible. While trends always involve pullbacks, if these are excessively large relative to total price level the benefits of catching the trend will be adversely affected. 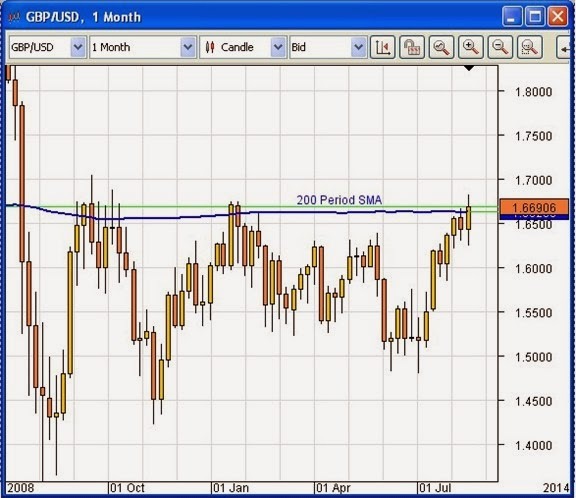 Trends are characterised by higher highs and higher lows for an uptrend, as in Sterling against the US dollar above, otherwise known as Cable, or lower highs and lower lows for a downtrend. The Silver Trigger and Mandelbrot software that we use has a number of features to help us to cope with the search and exploitation of trends. Firstly, they allow us to test pairs historically, using data going back many years, in order to establish the characteristics of individual pairs and their tendency to trend. 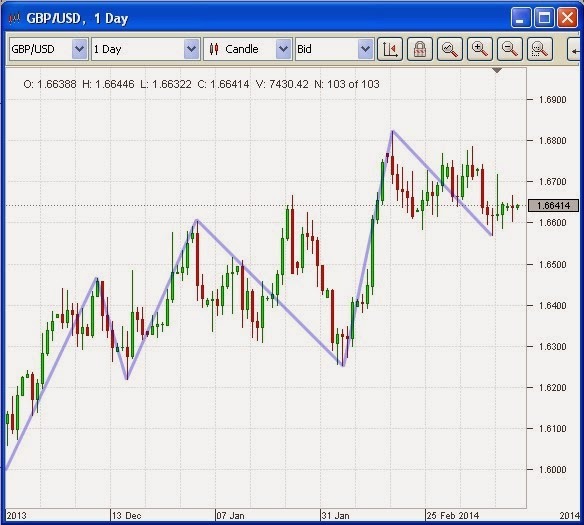 Secondly, both routines have triggers that identify the best entry points for a trade whenever a trend is identified. Thirdly, at the time when each trade is about to be entered, they calculate the position size, based on criteria that have been established by use of the Kelly Criterion, which is a respected mathematical formula to optimize the balance between risk and reward over time in trading. Fourthly, and most importantly, the routines have very clearly defined rules for exiting from a trade, whether in the case where profit needs to be locked in, or when losses have to be recognised and minimised. In all cases we use a Stop Loss order, but this is no more than a safety net. The rules for exiting from a trade will, typically, have been met by the software long before the stop is hit. In this way we attempt to keep probability on our side, because the trade will always have a positive expectation - a potential win that is materially greater than the risk of loss on the same trade. We are constantly refining the criteria for use with our routines in the light of experience, and we are constantly on the lookout for other pairs that will assist us in our endeavors to make profits. What is important to realise is that our software does not in any way constitute a robot or robots that can be turned on and left unattended, or be used effectively by people who have no understanding of the principles of trading and good trading practice. They are no more or less than tools for use by the initiated, but very powerful ones at that.